Metarhizium robertsii, a widely distributed insect pathogen, is presently used as a natural alternative to chemical insecticides. Unfortunately, its worldwide commercial use has been restricted by a short shelf life and inconsistencies in virulence. In our previous study, a gene (GenBank accession number EFZ01626) was found to be significantly upregulated in heat-treated conidia. In the present study, this gene was characterized via gene disruption and complementation strategies. The gene (amplified by rapid amplification of cDNA ends PCR) was 1219 bp long and contained an open reading frame (ORF) of 777 bp. It encoded a protein of 234 amino acid residues with a 26-residue signal peptide. Bioinformatics analyses did not identify conserved functional domains; therefore, it was assumed to be a secreted virulence-associated protein according to its signal peptide and bioassay results. We found that the conidial germination rate of the ΔMrSVP mutant fungi dramatically decreased after heat shock treatment in a thermotolerance test. In addition, transcription levels of all tested heat shock–related genes were significantly lower in the mutant than in the wild type. We also demonstrated that the mean lethal time to death (LT50) of ΔMrSVP significantly increased relative to the wild type in insect bioassays (both topical inoculation and injection) involving Galleria mellonella. 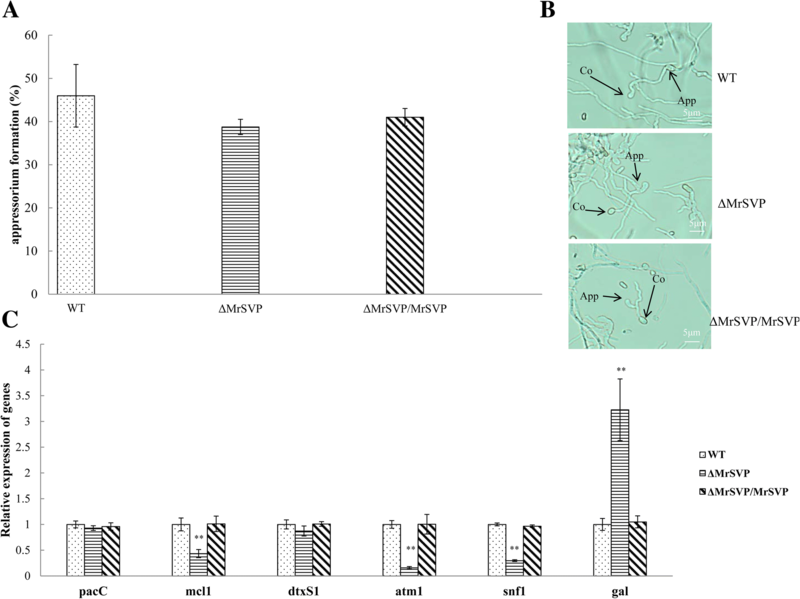 Moreover, similar rates of appressorium formation between ΔMrSVP and the wild type—and the significantly different expression of virulence-related genes such as acid trehalase and sucrose nonfermenting protein kinase in the haemocoel after injection—revealed that MrSVP is required for virulence in the insect haemocoel. Overall, our data suggest that the Mrsvp gene contributes to thermotolerance and virulence of M. robertsii. Furthermore, this gene is deeply involved in the mycosis of insect cadavers and in immune escape rather than insect cuticle penetration during infection. Metarhizium robertsii, the model species of an entomopathogenic fungus, has many advantages, such as a wide host range, environment-friendliness, safety to humans and other animals, and easy production and preparation. Unfortunately, commercialized worldwide use of fungal biocontrol agents is partially limited by the failure of conidia to retain viability during long-term storage, transportation, and use under high-temperature conditions [1, 2]. Moreover, the relatively unstable virulence of M. robertsii—as a fungal agent that uses living cells as the insecticidal component —is also cited as a critical obstacle to commercialization of this organism. Therefore, understanding the biological function of M. robertsii genes involved in thermotolerance and virulence will help to improve preparation quality and stability of insecticidal efficacy of this fungal agent. Genomic sequencing has revealed a total of 11,689 proteins in the M. robertsii genome, including 1278 secreted proteins, and a strikingly larger proportion of genes encoding secreted proteins relative to other fungi . Many of the secreted proteins belong to families that may have roles in colonization of insect tissues, e.g. proteases . Infection of an insect by M. robertsii is mainly subdivided into three steps: insect cuticle penetration; mass-propagation and secretion of toxins in the insect body; penetration of the cuticle again, and production of spores. To date, proteins secreted during the insect cuticle penetration stage, e.g., protease, chitinase, lipase, esterase, and other cuticle-degrading enzymes, have been widely studied . Lately, there is also some progress on elucidation of the Metarhizium adhesion process  via which M. anisopliae adheres to the insect epidermis or plant surface depending on two hydrophobic proteins, MAD1 and MAD2 . Following penetration, Metarhizium propagates in the nutrient-rich insect haemocoel via immune evasion and adaptation to osmotic stress , which is also involved in expression of the secreted proteins. First, Metarhizium can secrete a protein similar to host collagen (MCL1) onto the surface of its cell to avoid recognition and encapsulation by insect immune cells . Then, the species can express the MOS1 receptor protein to adapt to the high osmotic pressure of hemolymph. After that, it can grow by means of secreted acid phosphatase and trehalase to degrade organic phosphorus and trehalose, respectively, in the haemocoel of insects . At last, the fungi eventually secrete a large number of secondary metabolites to interfere with, inhibit, or counter the host immune response and to kill the insect. In this study, a gene (EFZ01626) with upregulated expression (more than 1000-fold) in heat-treated conidia of M. robertsii was found by high-throughput RNA sequencing (RNA-Seq)  and then identified as a gene with secreted-protein structure (named as Mrsvp) in M. robertsii. Here, the functions of M. robertsii Mrsvp were analyzed via a gene knockout: tolerance of the mutant strain to heat and the ability to kill Galleria mellonella were significantly weaker. The sequencing results on the 3′- and 5′-RACE-amplified fragments revealed that the cDNA sequence is 1219 bp long (GenBank accession number EFZ01626). The open reading frame consists of 777 nucleotides, and the 5′ untranslated region (UTR) and 3′-UTR are 278 and 164 bp, respectively. Downstream of the termination codons, the 3′-UTR contains a polyA tail signal sequence (ACTAAA) and a 20 bp polyA structure. The gene encodes a protein of 234 aa with a calculated MW of 23.931 kD and its isoelectric point is 6.698. Bioinformatics analyses revealed that there is a signal peptide sequence (from aa position 18 to 43), and conserved functional domains were not identified. According to the experimental results that the gene affects virulence , it was assumed to be a secreted virulence-associated protein and named as MrSVP. To characterize the functions of MrSVP in M. robertsii, the gene replacement mutant was obtained by means of a dominant selectable marker gene, bar. The ΔMrSVP deletion mutants were constructed by replacement of the coding Mrsvp gene regions with the bar gene cassette. Complementation strains (ΔMrSVP/ MrSVP) were obtained by transfecting the pben-SVP vector into the ΔMrSVP mutant. All the recombinant strains were confirmed by PCR and RT-PCR. PCR analysis indicated that a 692 bp fragment corresponding to the partial Mrsvp gene was present in the WT and ΔMrSVP/MrSVP but not in strain ΔMrSVP (Additional file 1: Figure S1B and C). A bar gene fragment (410 bp) is present in strains ΔMrSVP, ΔMrSVP/MrSVP, and a ben gene fragment (328 bp) is present only in strain ΔMrSVP/MrSVP (Additional file 1: Figure S1B and C). 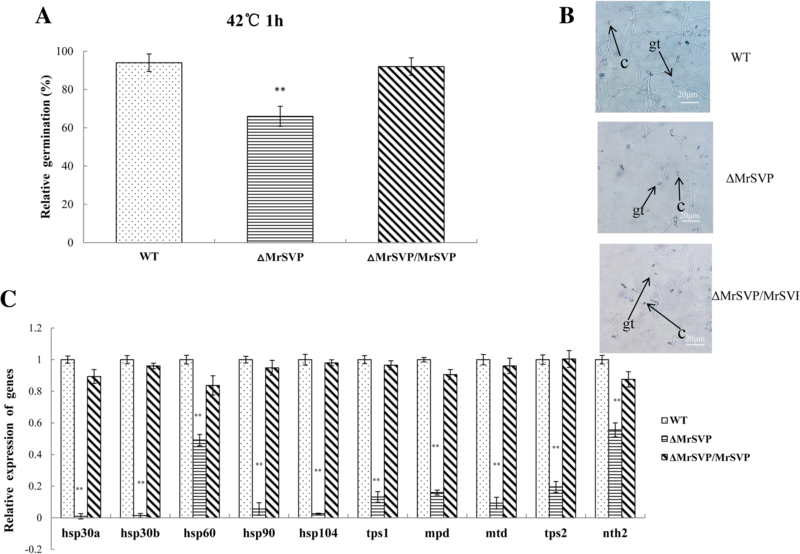 Loss of Mrsvp resulted in a decrease of conidial thermotolerance at 42 °C; 66.15% (P < 0.01) of the ΔMrSVP conidia germinated relative to freshly prepared control, whereas 94.28 and 92.33% of the WT and ΔMrSVP/ MrSVP conidia germinated relative to freshly made control, respectively (Fig. 1a). The expression of genes related to tolerance to heat shock in the fungus was detected by real-time RT-PCR . The relative expression levels of five heat shock proteins and five genes related to heat tolerance in mutant ΔMrSVP were significantly lower than those in WT and ΔMrSVP/MrSVP (P < 0.01; Fig. 1c). This finding was consistent with a decrease in conidial thermotolerance in the mutant. These data indicated that Mrsvp plays an important part in conidial tolerance to thermal stress. The tolerance of conidia to UV irradiation among strains WT, ΔMrSVP, and ΔMrSVP/MrSVP was not obviously different. The relative germination rates of conidia were approximately 79, 69, and 80% for strains WT, ΔMrSVP, and ΔMrSVP/MrSVP, respectively, when the conidia were treated with UV-B irradiation (Additional file 1: Figure S3B). Further analysis of variance of these data showed that there is no significant difference in the tolerance to UV among our strains: the mutant, WT, and complementation strain. Mutant ΔMrSVP manifested severely reduced virulence as compared with the WT in infection bioassays based on the greater wax moth, G. mellonella. For topical inoculation, comparisons of LT50 values showed that ΔMrSVP (LT50 = 8.08 ± 0.46 d) took significantly longer (41.75%) to kill as compared with the WT (LT50 = 5.70 ± 0.12 d) (P < 0.01; Fig. 2a). Regarding the injection, the differences were also significant (43.24%) between the WT (LT50 = 3.70 ± 0.13 d) and ΔMrSVP (LT50 = 5.30 ± 0.20 d; P < 0.01; Fig. 2d). The expression levels of genes related to virulence of M. robertsii in the insect haemocoel were detected by real-time RT-PCR. The relative expression levels of the genes involved in nutrition utilization or immune escape were significantly lower in mutant ΔMrSVP than in the WT and ΔMrSVP/MrSVP. Moreover, the expression level of the antifungal peptide of the insect was significantly increased (P < 0.01; Fig. 3c). In addition, with respect to appressorium formation, 44.17% of the germinated conidia from ΔMrSVP formed typical appressoria, and there was no significant difference from the WT (52.78%) and ΔMrSVP/MrSVP (50.34%, P > 0.05). These experimental data confirmed that the Mrsvp gene contributes to virulence of M. robertsii; furthermore, the gene is deeply involved in mycosis of insect cadavers and in immune escape rather than insect cuticle penetration during infection. In PPDA, PDA, SDAY, and 1/4 SDAY (four culture media), the WT and knockout strain (ΔMrSVP) and complementation strain (ΔMrSVP/MrSVP) grew normally. After examination of the morphology of colonies, of the density and height of aerial hyphae, of the shape of a colony edge, and the color of colonies, no obvious differences were found. By means of the medium diameter measurement in the mutant strain, and using the complemented strain and WT strain in four different culture media, we found that the colony diameters of the three strains were similar (Additional file 1: Figure S2A). When conidia from the mutant ΔMrSVP, ΔMrSVP/MrSVP, and from the WT were quantified compared with the yield obtained from the WT on SDAY, 1/4 SDAY, PPDA, and PDA media, the conidial yields of mutant ΔMrSVP were lower by 8.34, 18.54, 18.56, and 9.89%, respectively (Additional file 1: Figure S2B). There was no significant difference in variance analysis. Therefore, gene Mrsvp is not involved in vegetative growth and sporulation of M. robertsii. Effects of osmotic, oxidative, cell wall, antioxidant capability, and fungicidal stressors were examined on a PDA containing NaCl, H2O2, SDS, and Congo Red, menadione, and carbendazim respectively, with the data presented as radial growth (colony diameter). Contrary to our expectations, the colony diameter of the ΔMrSVP mutant turned out to be similar to that of the WT and ΔMrSVP/MrSVP in the presence of stressful chemicals (Additional file 1: Figure S3A). In the GenBank database, the studied gene (Mrsvp) was annotated as the Mcl1 gene, which has the same name with the first reported collagen-like protein MCL1 (DQ238488) in M. robertsii. 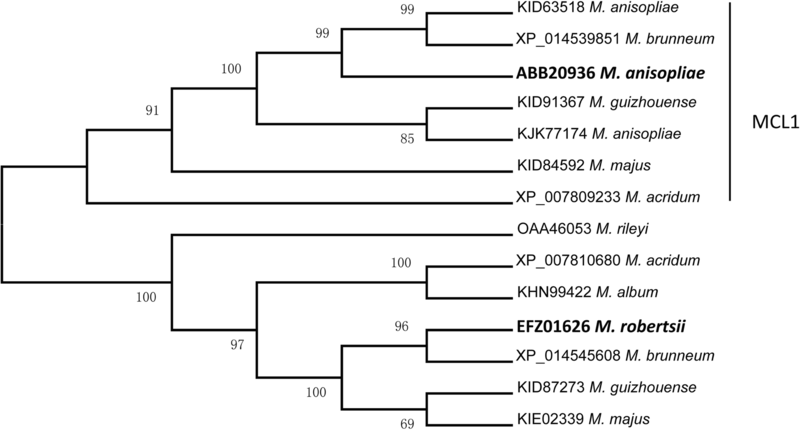 Phylogenetic analysis indicates that MrSVP in M. robertsii does not belong to the real MCL1 group (Fig. 4). Moreover, the amino acid sequence was BLASTed with the Mcl1 gene, and homology was found to be only 29%. Next, analysis of conserved domains revealed that MrSVP is different from MCL1 in M. anisopliae and is not typical xMcl-1-type fungal Mcl1-related protein, which includes the characteristic Gly-X-Y repeat of the collagen domain. Most of these sequences (absent in the D. hansenii protein XP460045) also had a three-domain structure, including a hydrophilic 5′ domain containing variable numbers of cysteine residues, a central domain of variable numbers (22–52) of G-X-Y repeats with multiple glycosylation sites, and a 3′ domain that varies in length . Accordingly, we can speculate that the Mrsvp gene may be incorrectly annotated as the Mcl1 gene. After penetration of the cuticle of an insect into the haemocoel, the entomopathogenic fungus may effectively obtain the nutrients in the host to quickly occupy the insect hemocoel. Trehalose is a nonreducing disaccharide that accounts for 80 to 90% of sugar in the hemolymph of insects and becomes the main nutrient for fungal growth after infection into hemolymph [15, 16]. Antifungal peptides, induced by a variety of bacteria and fungi, perform an important function in insect humoral immunity, which could be upregulated by fungi in the course of infection [17, 18]. In the present study, the expression of the antifungal gallerimycin (gal) gene from G. mellonella was found to be upregulated in insects infected by ΔMrSVP, compared with infected by WT, which is consistent with previous studies that gal gene was upregulated in insects infected by the fungi with gene disruption [19, 20]. In addition, the acid trehalase gene of M. robertsii was specifically downregulated in insect hemolymph after the disruption of Mrsvp. These data indicate that Mrsvp in fungi could facilitate the utilization of host nutrients for growth and reproduction. Therefore, we speculated the deletion of MrSVP resulted in the loss of the ability for the fungus to utilize the host nutrients, leaded to the host could rapid response for fungal infection, result in the high expression of the antimicrobial peptides (AMPs) such as gallerimycin. We observed lower sporulation on insect cadavers for ΔMrSVP than for WT and ΔMrSVP/MrSVP; this finding is not consistent with the conidial yield of the mutant on the artificial medium. These results suggested that the ability of ΔMrSVP to utilize nutrients decreased in the haemocoel of insects because of downregulated acid trehalase and sucrose nonfermenting protein kinase gene (which effectively degrades trehalose in insect hemolymph) and the downregulated snf1 gene, which regulates the derepression of glucose-repressible genes. Fungal conidia lose viability due to exposure to high temperatures during storage, distribution, or in field applications . Our previous study showed that the expression of Mrsvp in M. anisopliae increased by more than 1000-fold after heat treatment . The germination rate of these spores decreased after the loss of Mrsvp at 42 °C heat shock treatment in this study. These data confirmed that Mrsvp contributes to the fungal heat response. The heat shock proteins (HSPs) are well known for imparting thermotolerance, and various HSPs have been overexpressed in M. robertsii to improve its tolerance of heat . 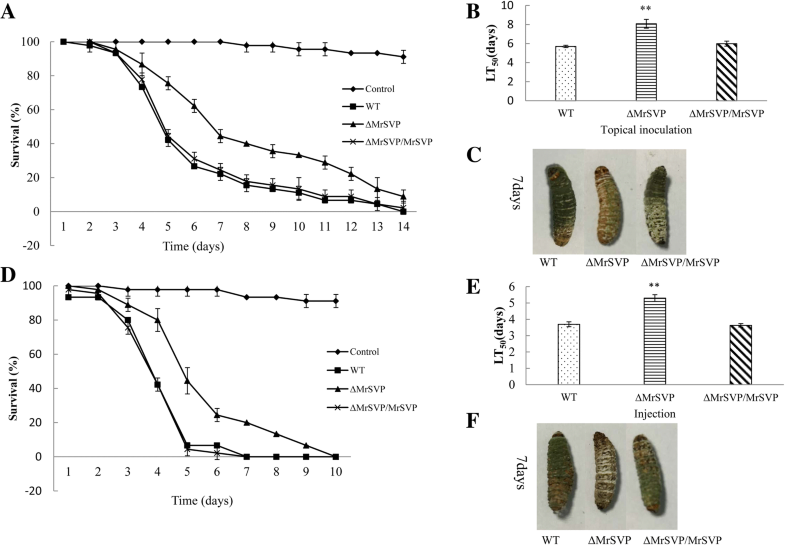 Of note, 10 heat tolerance–associated genes (five HSPs included) turned out to be downregulated in the ΔMrSVP mutant, suggesting that Mrsvp may serve as a critical functional factor in the fungal heat stress response via regulation of different HSPs. Furthermore, no significant differences in the effects of oxidative, osmotic, or UV stressors or in growth and development were detected between ΔMrSVP and the WT M. robertsii, suggesting that the Mrsvp biosynthesis in M. robertsii is not involved in these pathways. We can speculate that MrSVP is a secreted virulence-associated protein rather than a participant in other pathways. Overall, our data indicate that the Mrsvp gene contributes to thermotolerance and virulence of M. robertsii. Furthermore, this gene is deeply involved in mycosis of insect cadavers and immune escape rather than insect cuticle penetration during infection. Consequently, this study should deepen the understanding of the pathogenic mechanism of action of entomopathogenic fungi and will provide a theoretical reference for improvement of the preparation quality and stability of insecticidal efficacy of M. robertsii. Fungal and bacterial strains were cultured and maintained as noted before . The wild-type (WT) strain, M. robertsii ARSEF 23, the Agrobacterium tumefaciens strain AGL-1, and the binary vectors pDHt-SK-bar and pDHt-SK-ben were kindly provided by Dr. Chengshu Wang [5, 24]. M. robertsii was routinely maintained at 25 °C on potato-dextrose-agar (PDA) to obtain conidia. For extraction of genomic DNA, cultures were grown in Sabouraud dextrose agar plus yeast extract (SDAY) at 25 °C. Sequences of the Mrsvp gene (EFZ01626) were obtained from the NCBI database. Based on the retrieved sequence, two pairs of gene-specific primers were designed for 5′ and 3′ rapid amplification of cDNA ends (RACE) PCR to amplify the 5′ and 3′ ends of the gene. To obtain this gene’s whole cDNA sequence, the above sequences were combined. The molecular weight (MW) and theoretical isoelectric point (pI) were calculated using the Compute pI/Mw tool (http://www.expasy.ch/tools/pi_tool.html). The signal peptide was predicted on the SignalP 3.0 server (http://www.cbs.dtu.dk/services/SignalP/). Domain analysis was performed in the conserved domain database (https://www.ncbi.nlm.nih.gov/cdd/). Homologous Mrsvp and Mcl1 sequences from other Metarhizium species were retrieved from the NCBI database. For phylogenetic analysis, the deduced amino acid (aa) sequences corresponding to these sequences were analyzed by the neighbor-joining (NJ) methods in the MEGA 7 software . In brief, the upstream and downstream regions of Mrsvp were PCR-amplified from the genomic DNA of the wild type strain using the 3′ and 5′ flanking primers of the Mrsvp (Table 1). The Mrsvp deletion vector plasmid was constructed by amplifying the upstream and downstream regions, after PCR amplification, the PCR products were digested with EcoRI and PstI as well as SpeI and XbaI, respectively, then inserted at the appropriate positions of vector pDHt-SK-bar to produce the pbar-SVP plasmid (Additional file 1: Figure S1A). Plasmids were proliferated in E. coli DH5α and transfected into M. robertsii, using A. tumefaciens–mediated transformation (ATMT) to knock out target genes according to previously described methods . To construct the complementation vector, the PCR was carried out to amplify the Mrsvp gene plus 855 bp of the upstream sequences, the template was WT genomic DNA, and the primers were c and d (Additional file 1: Figure S1A). The amplicons were digested with SpeI and XbaI and inserted at the appropriate positions of pDHt-SK-ben (Additional file 1: Figure S1A). Plasmid Com-pben-SVP was mobilized in A. tumefaciens AGL-1 and then transfected into the mutant (loss of the Mrsvp gene). Table 1 lists the primers used for construction of knockout and complemented strains. The proportion of fungal feasibility (conidial germination rate) under stress relative to the feasibility in the control was defined as the survival index. This procedure was performed as described in ref. . Briefly, the conidial suspensions of the knockout strain, complementation strain, and WT strain were placed in a water bath for 60 min at 42 °C, followed by culturing on the PDA medium for 24 h; conidial germination was visualized under identical imaging conditions under an Olympus BX51 microscope; the conidia that had visible germ tubes were germinated. The tolerance of UV radiation was determined by measuring the conidial germination rate following exposure to UV-B irradiation . Briefly, PDA on a Petri dish (35 mm diameter) was inoculated with the conidial suspension of each strain, the PDA plates were exposed to 312 nm UV-B irradiation at gradient doses of 40–60 J/cm− 2. After exposure for 6 s and 48 h of incubation, germination rates were determined, and the method was alexandrine. Each treatment involved three replicates. Based on nonirradiated controls estimates, relative germination was calculated. It was computed using the counts of germinated and nongerminated conidia. Bioassays (topical inoculation and injection) were conducted on the last instar of G. mellonella according to previously described methods . For topical inoculation, insects were inoculated by immersion in conidial suspensions (1 × 107 conidia ml− 1) for 60 s. Control G. mellonella larvae were treated with sterile distilled H2O. For infection, 10 μl of an aqueous suspension containing 1 × 106 conidia/ml was injected into each insect. Control G. mellonella larvae were treated with 10 μl of sterile distilled H2O. All bioassays with three biological replicates, and 50 insects were used for each biological replicate. Examination of appressorium formation was performed on a hydrophobic plastic Petri dish as described elsewhere  with some modifications. The expression levels of the genes related to tolerance of heat shock were analyzed by real-time reverse-transcription (RT)-PCR. Total RNA was isolated from M. robertsii conidia. Conidia were harvested from 14-day-old cultures on PDA plates. Tolerance rates of fungal cells to heat shock were determined as described previously, and the conidia were collected after 24 h incubation at 25 °C. Total-RNA extraction, cDNA synthesis, and real-time RT-PCR were conducted according to the previously described methods . GAPDH (GenBank accession number EFY96862), a gene encoding glyceraldehyde 3-phosphate dehydrogenase in M. robertsii, served as an internal control . All real-time RT-PCR reactions were carried out in triplicate for each sample, and the experiment was repeated three times. The gallerimycin is an antifungal peptide that can be induced by a variety of bacteria, fungi. The peptide plays an important role in insect humoral immunity [20, 32]. Therefore, we examined the gallerimycin (gal) gene from G. mellonella and virulence-related genes (pacC , mcl1 , dtxS1 , atm1 , and snf1 ) of M. robertsii involved in mycosis of insect cadavers and evasion of host immunity. Fifteen G. mellonella specimens were each injected into the haemocoel with 10 μl of an aqueous suspension containing 1 × 108 conidia/ml. Briefly, G. mellonella specimens were collected at 48 h after injection. Total-RNA extraction, cDNA synthesis, and real-time RT-PCR were conducted according to the previously described methods . All experiments were repeated three times. All the primers employed for real-time RT-PCR are listed in Additional file 2: Table S1. For the knockout strain, the complementation strain, and WT strain, aliquots of 1 μl of 1 × 106 conidia ml− 1 suspension were centrally spotted onto the PDA, PPDA, SDAY, and 1/4 SDAY plates (9 cm diameter), maintained at 25 °C for 12 days, and then, the radial growth (colony diameter) in each plate was measured daily as described previously . To this end, 50 μl aliquots of conidial suspensions of the WT and mutants were smeared on PDA plates, followed by 3 days of incubation at 25 °C and cutting of disks (4 mm diameter) from fungal colonies. The disks were centrally spotted onto PDA plates alone (control) or supplemented with a stressful concentration of H2O2 (2 mM) for oxidative stress, NaCl (1 M) for osmotic stress, SDS (2.5 μg ml− 1) and Congo red (0.3 mg ml− 1)  for cell wall stress, and carbendazim (2 μg ml− 1) for fungicidal stress, with culturing for 12 days at 25 °C. Cultures for quantification of conidiation capacity were initiated by spreading 30 μl aliquots of a 1 × 107 conidia ml− 1 suspension on PDA (9 cm diameter) and were maintained for 14 days at 25 °C. The conidia on each plug were dislodged into 20 ml of 0.02% Tween 80 by 10 min vibration. Conidial concentration in the suspension was determined with a hemocytometer and was converted to the number of conidia per cm2 of plate culture as an estimate of the conidial yield. Relative expression levels were calculated by the comparative ΔΔCt method. The constitutively expressed GAPDH gene served as an internal control for each sample, and relative expression levels are shown as a ratio to those at 24 h and 48 h after inoculation respectively., which were set to 1.0 . All data were analyzed in GraphPad Prism 5 (GraphPad Software, La Jolla, CA, United States). Data were expressed as the mean ± standard error (SE) of at least three independent experiments. Student’s t test was performed to evaluate the differences between two means. For multiple comparisons, Tukey’s multiple-comparison test was carried out for significance analysis. Data with p values equal to or less than 0.05 were considered significant. Potato peptone dextrose agar medium. We say thanks to Yulong Wang, Deshui Yu, Qilin Zhang, and Tingting Zhang of the Anhui Agricultural University for help with unit tests, Zhangxun Wang of the School of Plant Protection, Anhui Agricultural University, for critical reading of the manuscript, and to Dr. Bo Huang of the Anhui Provincial Key Laboratory of Microbial Pest Control for discussions and suggestions. This work was supported by the National Key R&D Program of China (2017YFD0200400) and the National Natural Science Foundation of China (grant No. 31272096, 31471821, and 31572060). None of the funding body had any role in design and conduct of the study; collection, management, analysis, and interpretation of the data; and preparation, review, or approval of the manuscript. All data and analysis scripts are included as supplementary files. TX processed samples, analyzed sequence data, and wrote significant portions of the manuscript. TTZ collected and processed samples and was a major contributor to drafting the manuscript. DSY collected and processed samples, and contributed to study design. QLZ processed samples and analyzed sequence data. ZXW contributed to discussions of study conception. BH and YLW played key roles in the conception, design, and coordination of the study. All of the authors have edited, read, and approved the final version of the manuscript. This article does not contain any studies with human participants or animal subjects performed by any of the authors.